You may have noticed things have been a little quiet around here, that's because I just spent the last five days in Lisbon. I knew very little about Lisbon before booking our trip but I quickly fell in love with this beautiful city. Our Hotel, Olissippo Saldanha was out of the main hustle and bustle but within easy reach of public transport, with a metro stop on the corner of street and on the same line as the Airport which was handy. It’s a newly opened, modern and clean hotel. I could not find fault and they even offered soya milk at breakfast. A large supermarket across the road was great for stocking up on snacks and water, which saved a bit of money instead of paying tourist prices. My jaw dropped at the impressive selection of soya milk and the variety of flavours, for instance Alpro Red Fruit (aka Mixed Berries) and Vive Soy in Peach, Orange & Papaya Mango *mind blown*. The free from selection looked great for gluten free products. You need a sturdy pair of shoes for walking the streets of Lisbon. I would say the hills give San Francisco a run for their money. Despite the aching feet and creaking knees you are rewarded with the most amazing views. A cool beverage in a local cafe is a must before making the trek back down. If you want to do things the easy way, there are old and new trams to help you up the hills and three funiculars. Be prepared to squeeze yourself onto the older trams as they are popular with tourists. On one ride we were treated to an impromptu Portuguese sing-a-long, two old men with guitars and a lady belting out traditional songs. We visited some of the sights - Torre de Belem, Elevator de Santa Justa, Museu Calouste Gulbenkian and Castelo de Sao Jorge but mainly, we just wandered the narrow streets stopping to people watch, soaking up the sunshine and admire the views. Portuguese food mainly consists of cheese, meat, seafood, sweet pastries and more cheese. On our first day my pizza was served up with cheese but wait staff were extremely apologetic and the situation was rectified. Vegetarians are catered for but you have to seek out places for Vegans. I had found an excellent blog post on Vegan Lisbon by Radiant Flux which I had as back up but we didn't end up using it. We did attempt to find one of recommendations but ended up getting lost and hungry. Purely by accident, we came across a wonderful little Vegan cafe, Princesa do Castelo Restaurante, whilst stumbling down the hills of Alfama on our last day. 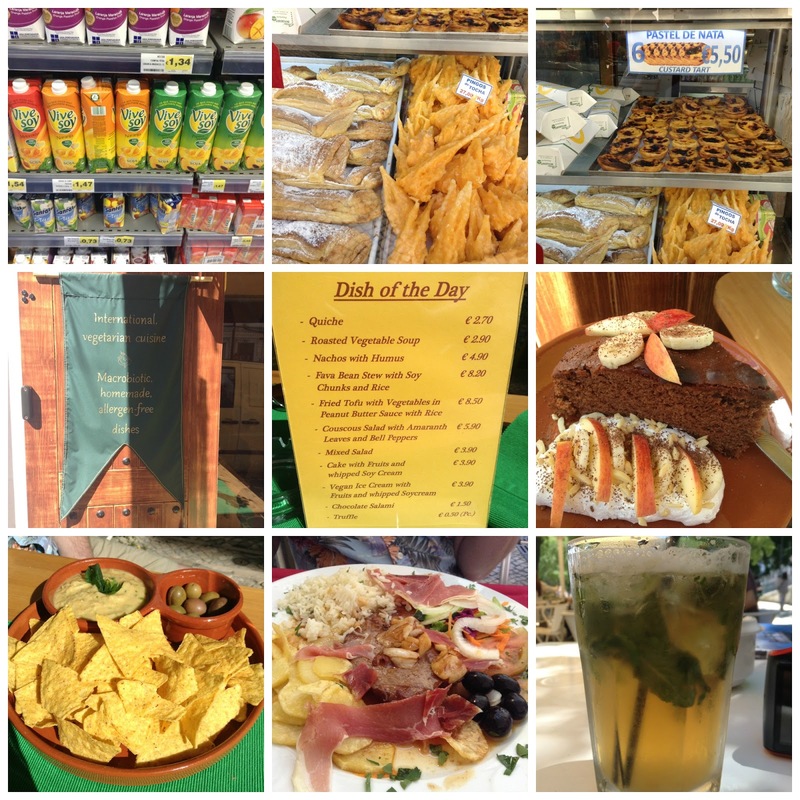 I stopped for a rest, turned around and spotted the green flag on the door – homemade, allergen free dishes. Despite the sign promoting Vegetarian cuisine, I was informed everything was suitable for Vegans and noted Gluten Free & Diabetic options. I had hoped for ice cream but it was tangerine flavour so I passed it up for a slice of chocolate peanut butter cake with whipped soya cream. I instinctively asked without fruit but the gentleman who served me gave me a puzzled look so I explained about fruit allergies. He must have thought I was the weirdest person as I rattled off a list of fruit I have to avoid and we settled on banana and apple. The menu wasn’t large but reasonably priced and a friendly service. Sadly, as it was our last day we didn’t have time to go back and sample more dishes. We did fall into the tourist trap with restaurants as I find my dietary requirements difficult to manage in the smaller places that are off the beaten track. Rua Augusta is the main pedestrian street. In some ways it reminded me of Las Ramblas in Barcelona because sadly it had a slightly seedy side which detracted from the beauty. You had to be aware of pick pockets, beggars and we were even offered drugs in broad daylight! I’m not naive but I was still shocked at how blatant these people are. We had a bland meal at Romans on Rua Augusta and we should have known better than to follow the Tourist trail. Amorino, the ice cream/gelato store was frequented twice by my other half. It’s a modern store not in the slightest rustic and authentic but he enjoyed his waffle and ice cream. We found the best seafood restaurants were on Rua das Portas de Santo Antao which was a recommendation in our guide book. Although be warned restaurant staff pounce on you with menus, something I’ve experienced in other places but I do find a little intimidating. I would recommend the restaurant which I think was attached to the hotel Residencial Florescente. We also stumbled across Brio Supermercado, natural and organic products galore, a bit like Wholefoods on a smaller scale. I would have loved to explore the skincare but I only had cabin luggage allowance so that limited me to 100ml for liquids. You’ll probably hate me for this but we found two Starbucks. A Very Berry Hibiscus drink went down very nicely on a hot day and I have another mug to add to my collection. This also inspired my blog title; our drinks were labelled Sara & Andre. I love the way our names became translated by locals. 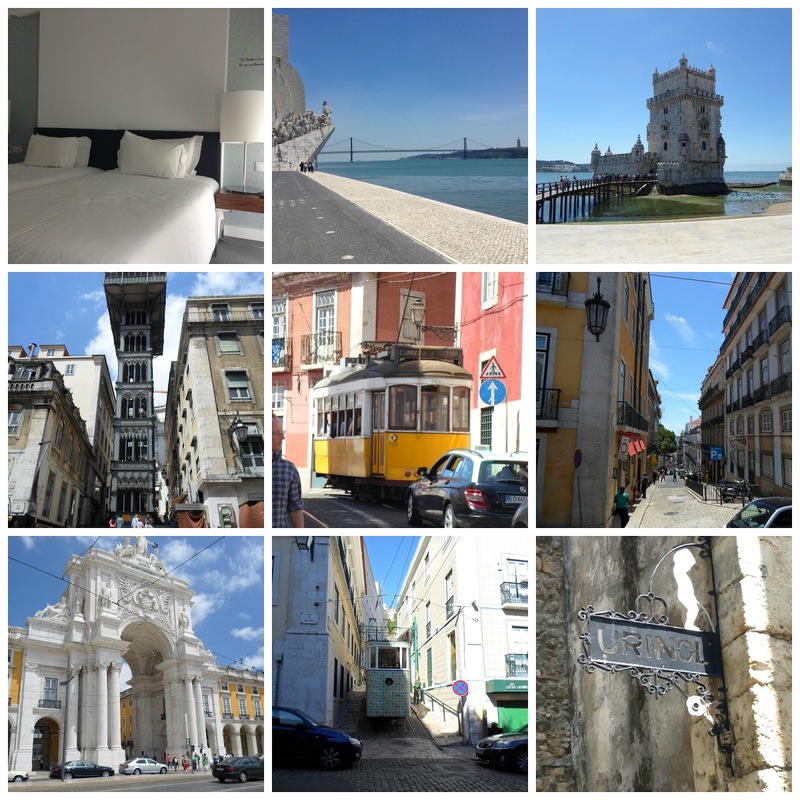 I have visited Saville, Granada, Paris, Barcelona, Milan, Brussels, Amsterdam and Rome but I have to say Lisbon was my favourite place, second to Rome. You must pay it a visit sometime and say Hello from me. For some reason, I've never considered going to Portugal. Been to Amsterdam several times and love it. Paris is on my bucket list. Well, Versailles more than Paris, with a stop at the Caudalie spa Les Etangs de Corot, which is outside Versailles. Great travelogue post Sarah! Absolutely beautiful! Sometimes I don't like living in Canada because our buildings are so boring!